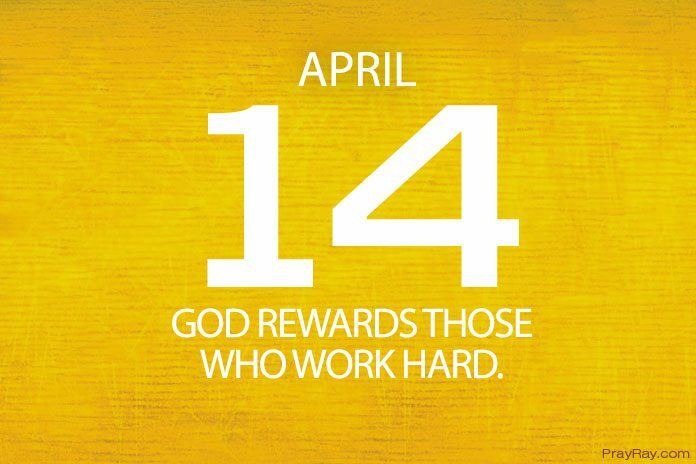 God rewards those who work hard – Prayer for April 14. A person that works hard and diligently will get a reward. We must do well in anything we find ourselves doing because it pays and working diligently promotes one. So let’s tell God to teach us how to work diligently. When you work hard and diligently, you’ll get promoted. You can’t be working diligently with all your hearts and still remain at the same level. The Bible stated it that a man working diligently and consistently will be promoted to stand before kings. Everybody loves someone who can help them to do their job effectively and very well. Even God wants us to do whatever we find ourselves doing with all our heart because there is a sure reward at the end. A man gave a testimony, he was working in a company and was earning low because of his position. His colleagues use to give him the works they supposed to do it for them. His boss also sends him to do the works he supposed to do. In the course of doing all these, he was learning more, he was gaining more knowledge and new ideas. When the external supervisors came to the company and they had to show them around. They got to where this man was and they were asking his boss questions but he couldn’t answer them. The man asked for permission to answer and he answered. He kept answering all the questions he was asked, then they decided to make him the boss because he knows better. It pays to be diligent at work and consistent too. Lord, it is written that the hand of the diligent shall be made rich. I ask you to teach me to be diligent in my works and never disappoint people and you. Let my work be blessed and promote me to a higher level where I will stand before kings and not just an ordinary man. Strengthen me to work more as I know that God rewards those who work hard. Pray in Jesus name. Amen.